One of the people at the Horse & Jockey (S of the H) on Saturday was Jake Frith, editor of Sailing Today, who frequently rows from his home at Netley down Southampton Water and up the Hamble to Swanwick where his office is. His boat is a plastic canoe converted to rowing by the simple wheeze of cutting a rowing station out of an old quad scull and bolting it down in the canoe. 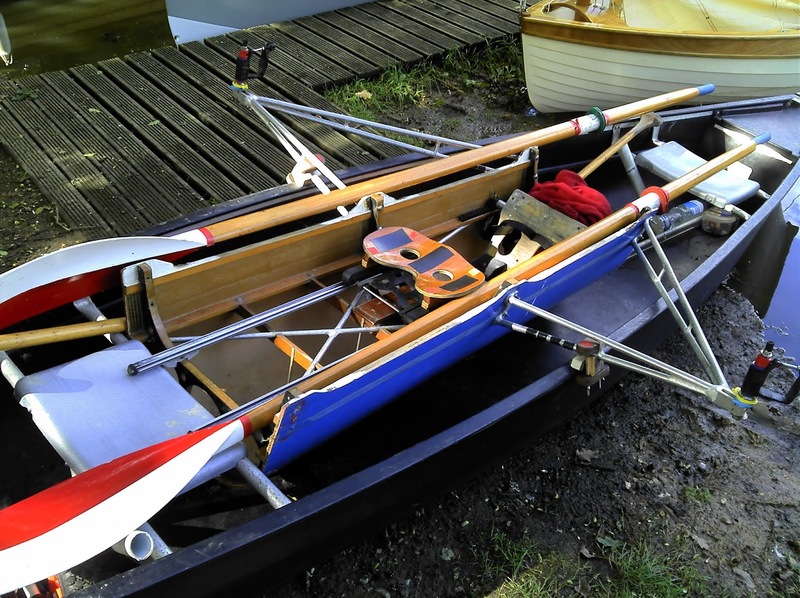 The quad scull in question was a defunct racing shell formerly owned by Eton College, no less. As you can see, the whole sliding seat and outrigger structure simply clamps into the canoe almost as though it was made for it. This is my sort of boatbuilding. Effective, fast through the water and simple to make. Also cheap. Perfect. If you buy a used rowboat. Check rowing stations. They should be mounted securely and free of cracks or splits. Look for perfect symmetry there should be no twist. Set boat on flat surface or turn over so keel is up. Keel should be flat or swept upwards at bow and stern. If the boat is made of fiberglass, look for cloudy spots which may indicate delamination, which is difficult to repair. Inspect chines (edges of the hull in flat bottom or multi-chined boats), especially at mid-point in the hull just below the waterline.